The IEP is extremely pleased to welcome Volition, The Cathedral Volunteer Programme as our new Corporate Affiliate. 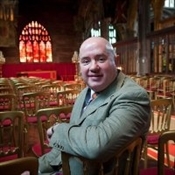 Volition began as The Cathedral Volunteer Programme (CVP) in 2012 with dual aims: to diversify the volunteer base at Manchester Cathedral so that volunteers reflect the local population as well as the visitor demographic which is World-wide; and to use volunteering opportunities as a genuine stepping stone for unemployed people to get in to sustainable jobs in the City and in this way, create social change and transform peoples’ lives. With very small investment initially, the CVP was launched in partnership with Jobcentre Plus/DWP. With impressive results, Jobcentre Plus re-commissioned the programme a number of times for Greater Manchester and Liverpool. The CVP was rebranded in 2015 as Volition Community and became an independent charity (CIO) which is chaired by the Dean of Manchester and made up of directors from voluntary, private and third sector organisations, all of which have played an instrumental role in its development. Volition’s plan now is to extend the programme to other cathedrals across the UK. In May 2014 Volition was awarded the NESTA Social Action Innovation Fund which focuses on a small number of big social challenges, such as supporting people into work. Volition’s core belief is ‘that unemployed people increase their employability through volunteering’ and to date over 700 volunteers have benefited from the programme with 50% of people now in jobs. What do Volition volunteers do? Anthony O’Connor, Director of Fundraising and Development Director for Volition Community said ‘Our innovative approach aims to open up more opportunities and jobs to unemployed people. To mobilise unemployed volunteers, it is important to first recognise that their primary need is for paid work: work is the best route out of poverty but the journey to work can be complex, stressful and not always designed around the person. Being explicit about this defines all that Volition does: structured pathways to work, transferable skills, community action, mentoring / coaching from other adult volunteers, staff and business. Speaking of Volition’s Affiliation to the IEP, Chairman Scott Parkin FIEP said “Volition is a fantastic example of employability support at its best being delivered at the heart of the community in Manchester and Liverpool. They are committed to coaching and mentoring as a key part of the support they offer and the work they do to widen volunteers' horizons and aspirations, providing new experiences and setting high expectations is very much in line with the IEP’s values. We are delighted to have them on board and to work with them to further the IEP’s aims and the professionalization of the sector as a whole”.